Pawel Althamer Brings Everyone and Their Brother Into the New Museum for "The Neighbors"
Polish contemporary artist Pawel Althamer isn&apos;t breaking down the white walls of the museum; he&apos;s dissolving them. By bringing the music of street performers, the talents of local high school artists, and sculptures of Venetian citizens into the museum, Althamer smoothly pushes together people from different social and economic classes under one roof. For his show, "The Neighbors," which opens tomorrow at the New Museum and runs until April 13, Althamer has filled four floors with everyone and his brother. Walk into the 4th floor gallery of the New Museum, and you enter what looks like an enormous laboratory manned by hippies (at least on the first day). People in white smocks decorate the gallery walls and a canvas tipi in the middle of the room with black paint, charcoal, graphite, and colored pencils, and visitors are invited to participate. During the press preview, journalists took up paintbrushes alongside students from New Design High School on the Lower East Side. A street performer wandered around the space playing a trumpet. Perhaps Althamer wanted this to look like an artist&apos;s lab because it seems like a utopian social experiment, bringing different strata of people into one room for the sake of art. One high school student&apos;s message, "PEACE LOVE HOPE," fits this theme. Of course, when subsequent crowds pour into the gallery, it might look more like the walls of an insane asylum than a harmonious laboratory. Althamer brings together different people, not only through participation, but also through depiction. One floor houses his installation Venetians, originally created for the 55th Venice Biennale, made up of numerous sculptures of people he saw while walking around Venice. Althamer created the skeletal figures from frames of cast plastic hung with ribbons of melted plastic. The effect is uncanny; the gallery appears to be haunted by nearly human forms. In the corners of the Venetians gallery are Althamer&apos;s video works, depicting the artist taking drugs, undergoing hypnotherapy, and witnessing the birth of his child. These videos, saturated with extreme emotion and life, stand in contrast to the haunting figures, yet because they are on a screen, the people in the video feel less present then the sculptures. Similar to his Venetians, Althamer&apos;s other sculptures have a human element even when they don&apos;t resemble people at all. Many of his figures are stitched together, and the seams are obvious. It&apos;s impossible to shake the feeling that they&apos;re not quite whole. Black Market consists of an unfinished ebony sculpture that was carved by African immigrants Althamer hired, again bringing different social spheres into the creative process. On one hand Althamer&apos;s "Neighbors" are the people that we live near from different backgrounds all coming together for the name of art. But Althamer&apos;s sculptures suggest another kind of side-by-side living, one where we live close to another reality. 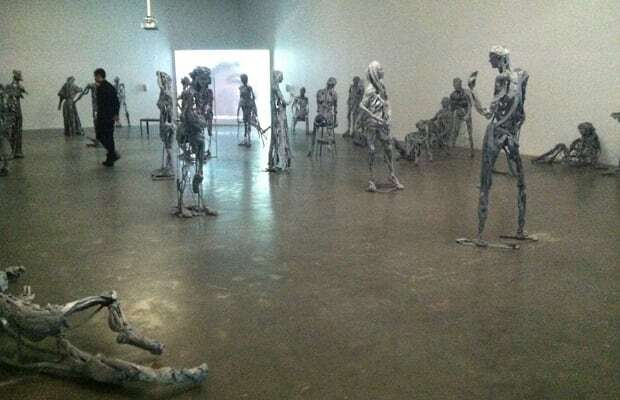 This reality could be death, as in Althamer&apos;s ghostly sculptures. It could be the reality of folklore and myth, as in Althamer&apos;s miniature scene of a child&apos;s story or his two legged horse sculpture. Or it could be the alternate reality of the mind, like in his drug trips recorded on video. "The Neighbors" brings us closer, not only to each other, but to the visions conjured up in our imaginations.